Located on the 01 Level, the Chartroom was the home of the ship’s quartermasters. 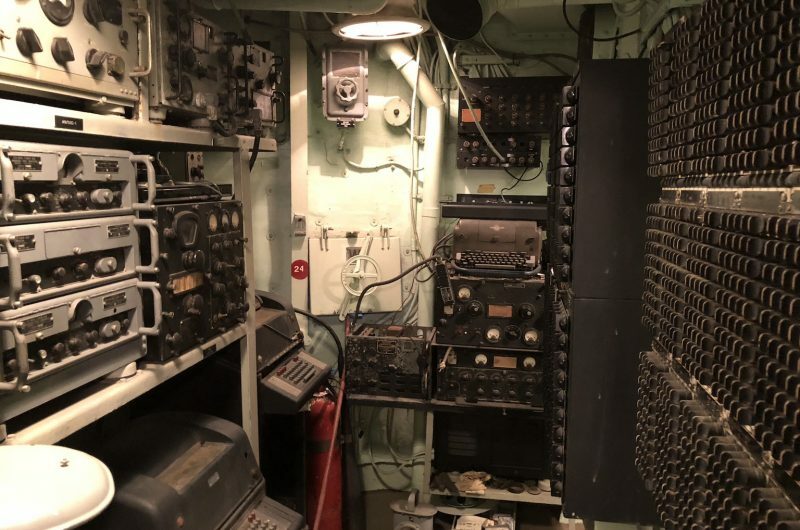 These men keep track of the ship’s position through dead reckoning, piloting, celestial navigation, and electronic navigation such as LORAN and radar. It was a common joke that “we never know where we are, only where we’ve been.” In the drawers were stored charts for almost every body of water in the world. 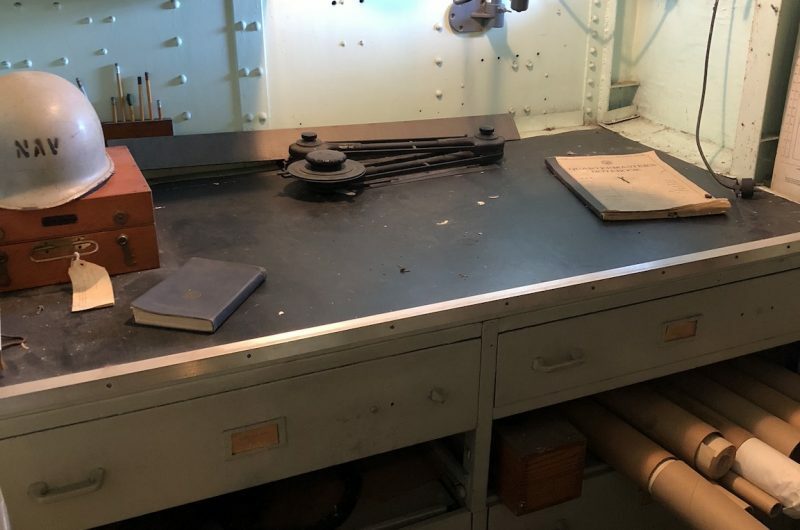 The Navy Department Hydrographic Office published weekly corrections to charts in the “Notice To Mariners.” The chore of applying these corrections to a world-wide chart portfolio was dreaded by most all quartermasters. Navigating through Japanese islands was a risky business in World War II. Much of the information on charts dated back to British and American surveys in the 19th century. So antiquated were some of the charts that it was not uncommon for some vessels to find themselves navigating the coral reefs and atolls of the South Pacific using maps developed by the National Geographic Society. Main Radio Central contains radio transmitters and receivers that allow the ship to communicate at long ranges. 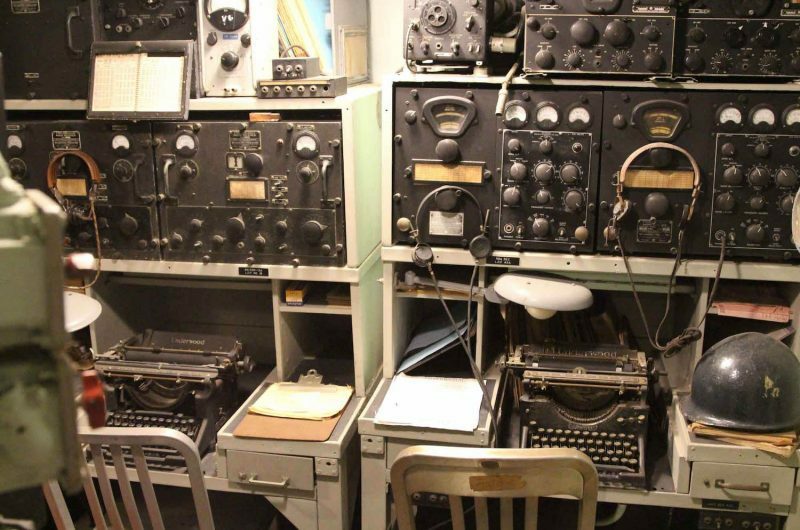 During World War II, operators sat at their typewriters, or mills, and typed out the messages that came over their headsets in encrypted Morse code. Messages addressed to the ship were turned over to the communications officer who deciphered them and passed them on to the Captain. The Fox Schedule was a constant stream of messages broadcast by Naval Headquarters to all ships in the fleet. “Guarding the Fox” was the unending process of listening to these messages so that no pertinent messages would be missed. Ships always operated under radio silence, so no acknowledgement was expected when a ship received a message addressed to her. A missed message could result in a ship’s failure to participate in a major action.